Subud is democratically organised into local, regional, national and international bodies. The World Subud Association (WSA) represents the Subud community as a whole and is made up of delegations from each country. The Subud organisation exists today in over 80 countries. 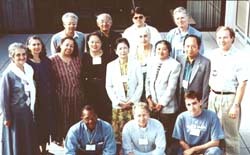 The World Subud Association (WSA) represents the international Subud community and was legally established in the USA following the World Congress in 1989. Its constitution expresses its aim in three major fields - the spiritual, the development of Subud and care of its members' needs, and work towards a better world. The World Subud Association (WSA) meets every 4 years when a World Congress is held. Subud Congresses have been held so far in Britain, USA (twice), Japan, Indonesia, Germany, Canada, Australia, Colombia, Austria and New Zealand. The day-to-day management of Subud's affairs is carried out by the Executive Committee. Subud is generally represented by a National Committee in each member country. For efficiency of organisation, National Committees are grouped into nine Zones. The kejiwaan structure parallels the committee structure from group level to international, except that the international helpers are grouped into 3 areas rather than the existing 9 zones. Although helpers and committee have distinct responsibilities, they work alongside each other throughout the Subud organization. The committee side enables the work of the helpers to continue and develop through its financial support, as does the work of the wings. Both helpers and the committees serve the members in their worship of Almighty God. Preserve the practice of the latihan so that it will remain available to people everywhere in the form in which it was originally practised under the guidance of Bapak. The Wings are autonomous organisations with representatives who sit on the World Subud Council and are members of the World Subud Association. Their mission is to carry out Subud's aims in the social and humanitarian field, entrepreneurial development, cultural and youth programs. It is important to realise that there is a direct connection between the spiritual experience of the latihan and Subud members' activities in the world. Therefore the Wings are not simply organisational instruments but channels through which Subud members express the fruits of the latihan in business, culture, social welfare and other realms of human activity. The charitable wing, Susila Dharma International Association, (SDIA), represents the social and humanitarian work of Subud members. SDIA has category II consultative status with the United Nations Economic and Social Council and UNICEF as a non-governmental organization (NGO). The purpose of the cultural wing, Subud International Cultural Association, (SICA), is to encourage and support the expression of human culture and human values through initiatives around the world that enliven and enrich the human spirit. The objectives of the youth wing, (SYAI), are to help young people develop their talents, identify direction for their life work, and assist them with planning and taking steps toward their field of studies and careers. It organises activities and programs run by, with, and for young people to meet their needs and interests. It aims to facilitate international communication between youth of all nations and cultures. The enterprise wing, Subud Enterprise Services International, (SESI), provides support, encouragement, and networking opportunities for entrepreneurial activities. Businesses contribute expertise as well as funding to charitable, cultural, and youth projects, and to the Subud organization. Important landmarks in the development of Subud have been the World Congresses which have been held in various countries, generally every four years since 1959. At these gatherings, presided over by Bapak during his lifetime, the main lines of how Subud and Subud members should function in the world have been defined. Delegates bring reports and questions from their home countries and it is possible to see a brief history of Subud, particularly its organisational development, by reading the Congress reports. The Congresses reveal both how Subud has grown and responded to changing circumstances, and also how its fundamental inner truths have remained the same. No fees are charged for doing the latihan and costs are largely met through voluntary contributions from members. The WSA operates on the support of national committees, individuals and enterprises of Subud members, in the form of voluntary contributions, which finance the international activities according to the annual budget. WSA also produces and circulates annual financial reports to all national committees. Each year, the national committee makes a pledge as to the amount of their international contributions, and the WSC meeting draws up the WSA budget for the following year based upon this information. Delegates of the Eighth Subud World Congress established a Constitution of the World Subud Association to manage the necessities and requirements of the membership of Subud in accordance with the guidance received by Bapak Muhammad Subuh Sumohadiwidjojo, the founder of our Association. The Constitution was revised at the Tenth World Congress. For organizational purposes, the World Subud Association is divided into nine zones and three geographic areas for assisting individual members and groups in the practice of the latihan. There are approximately 13,000 members worldwide in a total of 86 countries and of this, 54 are member countries of the WSA.